They all have leg hairs but I've never seen black in the joints. Mine are all golden colored tufts. Is it just in one joint? Or multiple? Could it be something stuck in there? It's on both front joints but no where else. It looks very symmetrical when you see him walking from the front so I dont think it is something stuck in there. Hair (setae) in that location is normal. 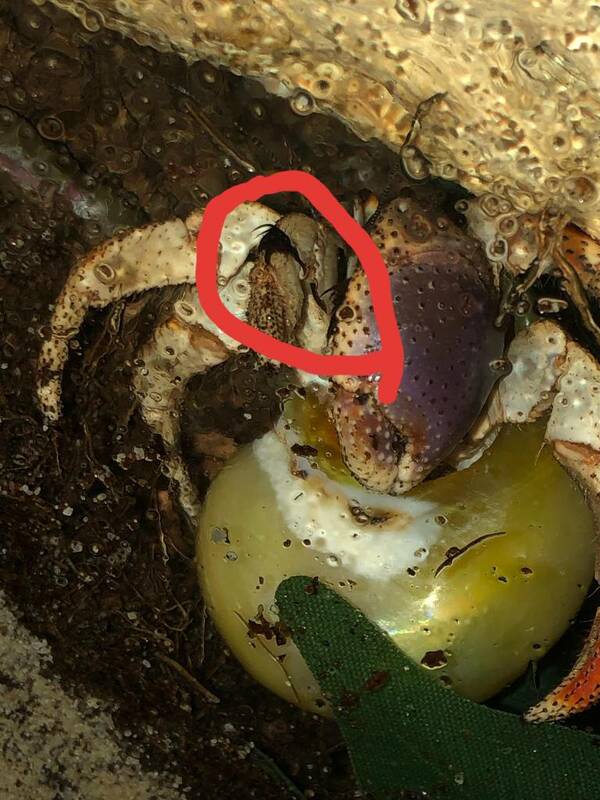 All crabs have it, larger crabs have more. SG is right in that it's normally pale or golden in color. I'm not sure I've ever seen black. 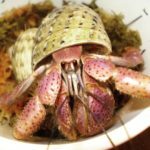 However, there is a lot of variation in hermit crabs. There is also a possibility that it could be stained from substrate or something else in the enclosure. Or it could just be he hasn't molted in so long that the color has changed over time, and he may come back up from molting with pale hair again. Thank you for the info! His buddies that we adopted at the same time as him have all gone down for their molts, so I suspect he will go down soon as well. They were purchased at the beach by a well meaning family but they had no idea how to properly care for them. So I think things have been rough for him. I can't wait to see if there is a change after he molts. They are such interesting creatures. That's pretty interesting! I'm curious to see how this one comes up after he/she molts! Please keep us updated!